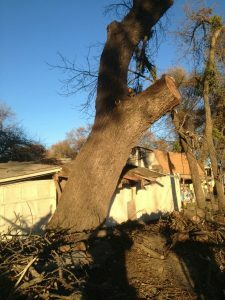 We salvaged this tree from an old farmhouse in West Sacramento, Ca. This tree was severely leaning, dying and began to drop branches. The farmer had us come in and remove it for him. The tree had an old electrical cable wrapped completely around the base. The tree was approximately 100 years old and the wire was attached to the tree about 50 years ago. This beautiful tree has very nice Black Walnut Color and is going to make gorgeous Live Edge Slabs.